I’ve always struggled with acne and as I get older, I still get breakouts and blackheads like my 18-year-old self. Of course, getting regular facials has helped dramatically but I still need something to keep my skin in check at home. I have combination skin and I find the dry areas around my eyes and cheeks show the most signs of dehydration, however my forehead, nose and chin flare up with pimples repeatedly. 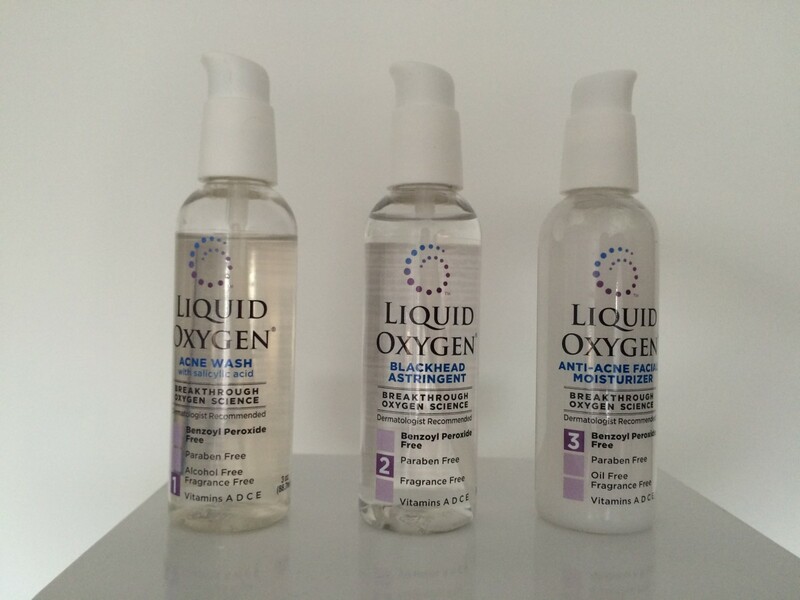 When the folks at Liquid Oxygen invited me to try their products, I jumped on board. I’ve been using the three-step system for about a week and so far, so good. The products use Oxygen, Salicylic Acid and Vitamins A C D & E, and were developed over a two-year period by a plastic surgeon to improve skin quality. Most acne formulas use Benzoyl Peroxide but Liquid Oxygen believes that it can only dry out the skin and actually produce more acne. I’m a big fan of oxygen facials and highly recommend them before a big event as they truly make your skin glow; so why not work oxygen into your regular routine? Oxygen helps to stimulate cellular growth and decrease redness, inflammation, and irritation on the skin’s surface. It seems like a worthwhile ingredient in your skincare routine to me. 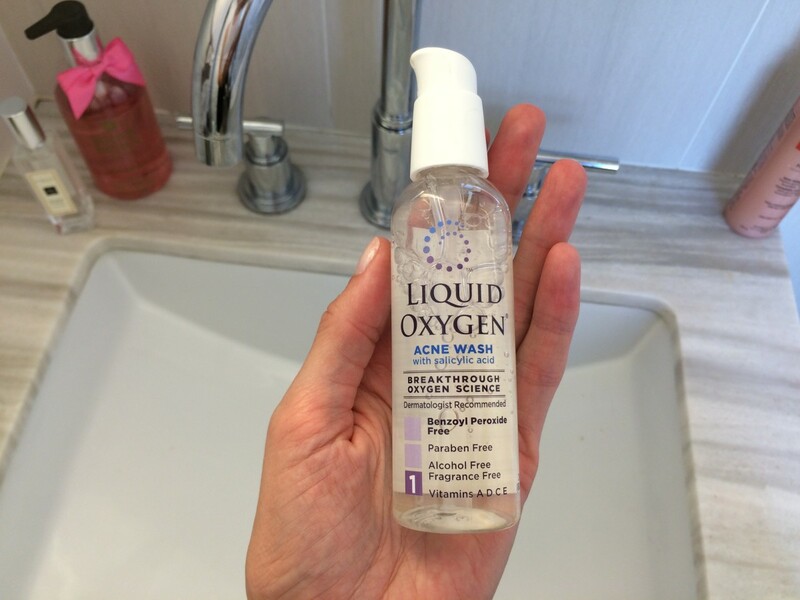 Like other acne systems, Liquid Oxygen has three steps that are easy to use and quick to apply. The first is the Acne Wash with salicylic acid. The clear formula is gel-based, feels smooth to the touch, and creates a slight foam when worked into the skin. You’ll find a hint of lavender scent which instantly transports me to my friend’s basement in the late 80s where we would do elaborate facials on one another while we flipped through the latest Seventeen magazines for inspiration… but I digress. Next up is the Blackhead Astringent. This clear liquid has a slight tingle when applied to the skin but nothing that will make you uncomfortable. Finally, the Anti-Acne Facial Moisturizer is a thick gel, reminiscent of Cetaphil and absorbs quickly into the skin. The products claim that you’ll see results in only one day, but that seems too good to be true from my perspective. My skin is definitely clear and I haven’t had any breakouts since I started using the product, but I’m finding I do have some dryness on my t-zone. I think I’ll add a gentle scrub to the routine a few times a week and that should get rid of any excess dryness that I seem to be experiencing right now which could be the after effects of a fairly recent facial with peel or simply the weird weather.